Welcome to our podcast series “Broader Perspectives For Better Experiences”. In this, our 4th episode, Martyn Sibley talks with Edward Richards, a Graphic Designer and Open Inclusion Community Lead. Ed also shares perspectives on two specific pieces of work he did last year at Open. One of these was being MC at the Web Accessibility Day we held at the Shard last February. Tony, his interpreter voiced for him. They were great! The other was a video he was involved in as part of the on-screen talent. In both, he was able to just be himself and be presented and engage as a guy who happens to communicate in another language, but otherwise is pretty much like everyone else. Please have a listen or watch the video and enjoy the interview. 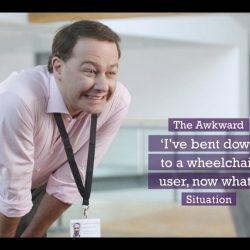 If you would like to better understand the customer experiences that your business provides to people with access needs such as Ed, or take powerful steps to improve them, please contact us. We would be happy to help you.